GeoKrety (from Greek: Geo, “earth” and Polish: krety, “moles“.) is an internet service similar to Travel Bug or GeoLutins, aiming at tracking objects you leave in geocache containers. People move these registered objects (called GeoKrety) from cache to cache and register each move with this service. 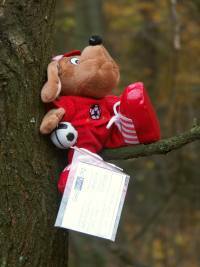 #Description A GeoKret can be anything, but in most cases it is a small puppet or other small thing which can be placed in the geocache containers. During the registration of the Geokret on the website, the owner assigns a name and may also create a purpose or mission for the Geokret. These missions can be as simply as “to travel as far as possible” or to travel to a specific cache, location or a certain type of location. On Geokrety.org, each item has an individual page which tracks its movement and calculates the distance travelled. In the process of registration, the unique Tracking Code is assigned to the new Geokret. After registering, user must create a label for the Geokret, with its name, mission, the Tracking Code and the website address. Optionally the short user’s manual and the QR code can be added. The label then should be protected against moisture, e.g. by laminating. GeoKrets are not a trade items, you do not have to put something in the cache to take a Geokret, and you should not take something from a cache in trade for a GK. If you should take something from a cache, you should make a trade, and you can place the GK. There is no obligation to pick up a Geokret from a cache as geocachers can simply “discover” the item on the website. To log a move or discovery of the Geokret, you have to enter its Tracking Code and the place or cache where you put it. It can be identified by the waypoint (the cache coordinates are acquired automatically for most geocaching services), by the cache name or simply by coordinates. The service is free to use. All content (including descriptions of the Geokrety, illustrations and all their entries in the logs) made available by publishing them on our site users are licensed under Creative Commons. The service was started 2007-10-26 20:36 and is operated by the group of volunteers. As of January 8, 2012, there were 20098 registered Geokrets and 167009 logs. All geokrets (excluding human-type) travelled 16579482 km. #Supported services Geokrety are not associated with any particular geocaching service. Users are allowed to place Geokrety in caches registered in any database, as well as in other places (e.g. at home) indicating it by entering the place’s coordinates. To simplify the Geokrets’ logging operation, the geokrety.org is fetching the caches information (like a waypoint name, coordinates, description) from many popular geocaching services (e.g. Opencaching Network, GeoCaching Australia, GeoCaching Russia, gpsgames.org database (Geocaching and Geodashing), Geocaching Romania, Geotrekking Hungary, geopeitus.ee and others). For those fully supported services, to log geokret only its Tracking Code (printed in the label) and cache waypoint is required, as all other data (like cache’s title and coordinates) are completed automatically. As of January 8, 2012, there were 665997 waypoints (with full cache information) in the geokrety.org database. When dropping a Geokret into a cache listed at geocaching.com only, the coordinates must be entered manually. A browser plug-in for Firefox and Chrome is available to do this automatically. #QR-Code Some Geokrety labels has a printed QR code, encoding its tracking code. After taking a photo and QR code decoding the user is automatically taken to the appropriate website to log the Geokret move. Some fields are completed according to the information read from the QR code. No special application is required for this task.